Jewry appeared in Žilina only in the 19th century. There were only two Jewish families living in Žilina until the middle of the 19th century because the town was not willing to allow more Jews to settle. They could come during the day to do the business, but they had to leave the town for the night. The two mentioned families were the WIX and SPANYOL families. This can be explained by the fact, that town Žilina with mainly German commons did not accept the Jewish fugitives and therefore they settled in neighboring villages: in Varín, Martin, Rajec, Čadca etc. The first families we could meet here, besides already mentioned WIX and SPANYOL families were the POPPER, ROSENFELD and WEIL families. They had the meeting-house Salem built already in 1850, and they also had the cheder, the Jewish public school. It was supervised by IZIDOR LINDENSTEIN. 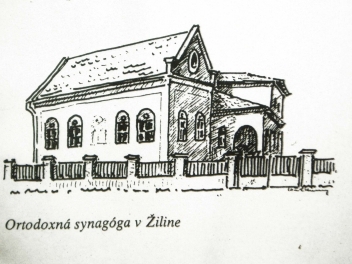 22 Jews lived in Žilina in 1851. The community had also functioning Chevra Kadisha. 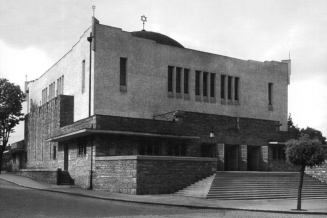 In 1881 the Jewish religious community was so large, that they had to build their own synagogue, where the worship was practised till 1930. In the same time they started to build the Jewish public school where Dr. KAROL KOHN was the first schoolmaster. The high level of this school is proved by the fact, that the whole third of its students were the Christians: 58 Catholics, 27 Evangelics, 5 of state religion (Czechoslovak religion) and 9 without religion. Later JOZEF ŠALGÓ an excellent educator and member of the cultural committee of Žilina region was the administrator of the school. The community had also the ritual bath, well known Chevra Kadisha, and many edifying and charitable companionships. As a matter of fact, there were two religious communities in Žilina: the neological one and the orthodox one which was formed in 1921. The orthodox community was approved by the state only in 1925. Many notable rabbis worked in Žilina, among them the poet Dr. ARNOLD KISS, an excellent orator. He was the rabbi in Veszprém and Budín later. In the first third of the 20th century the number of Jews grooved so much, that the need of building a new synagogue became urgent. The decision was made in 1929. 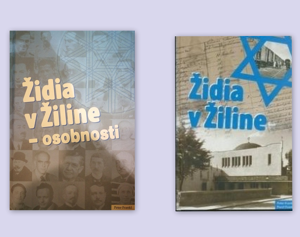 It appertained to the most modern and the most beautiful Jewish buildings in Slovakia. 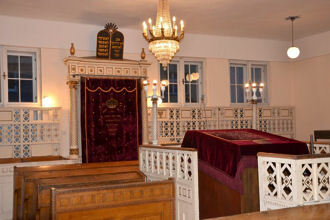 The synagogue was finished by the end of 1931 and stayed on the place of the old synagogue from 1881. 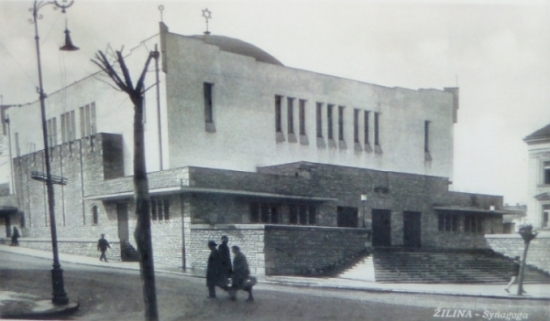 During the construction of the synagogue, all religious services were carried out in the Jewish public school. The new synagogue is a modern building with a cupola, designed by Berliner designer Peter Behrens. 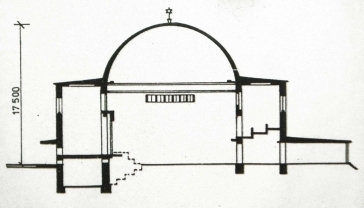 The plain walls and the flat cupola created a harmonical unity together. Four staircases led to the gallery for women. 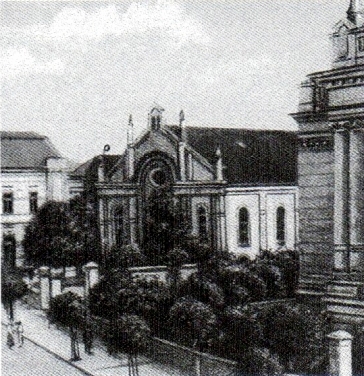 After the war this synagogue was rebuilt to a concert hall according to the designs by an architect Václav Čapek. There was also the Peter Jilemnicky Theatre located temporally in the synagogue. 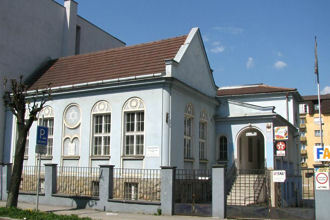 The orthodox synagogue on Daniel Dlabač street no. 5 is a simple building with a meeting-house Salem and adjutant rooms. There is also a flat and a small backyard near the synagogue. Also this synagogue was renovated after the war. 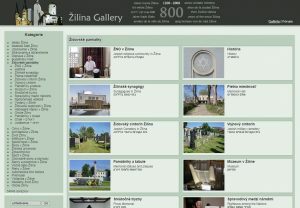 In 1942 there was 3500 Jews living in Žilina and its surrouding. 3000 of them were Jews originally from Žilina, and the rest 500 Jews were those who relocated themselves to the town from the small cities and villages after adoption of anti-Jewish legislature in the years from 1938 to 1941. They could not stay at their hometowns or did not feel safe there anymore. A great collection camp was located in Žilina from where innumerable transports were dispatched to the concentration camps. The last neological rabbi was Dr. HUGO STRÁNSKY, and the chairman of the community was Dr. ALEXANDER MARTON. As to the orthodox, there was the last rabbi MARTIN KLEIN and the chairman IGNATZ KLEIN. Only 700 Jews came back from the concentration camps. 500 of them emigrated shortly after the end of the WW II in the first wave of emigration between 1948 and 1949. After that the emigration was forbidden. In the beginning of the ’50s there were about 200 Jews living in Žilina. The Cemetery is located in the west side of the town. The entrance is furnished with a gate with grillage. Behind it, there is an alley. Just near the gate there is a large ceremony hall, to which some smaller buildings were added. In the large impressive hall, there was a wonderful monument built according to the design by an architect JOZEF ZWEIGENTHAL, it is a 5.5m high pyramid, covered with black Swedish granite. On the walls of the hall there are white tablets with the names of those who were killed as victims of fascism. The cemetery lies on the horizontal terrain. Some of the tombstones were damaged in 1958 by unknown offenders. The inscriptions on the tombstones are in Hebrew, Slovak, German, and Hungarian. The tombstones are made of various stones and in various kinds.